CCTV recently reported that Davinci, a furniture manufacturer whose products are all listed as being “Made in Italy”, has in fact been producing their products in China. The products obtain an “import certification” after a one-day tour in Shanghai Waigaoqiao Free Trade Zone. In today’s free competition market, a commodity can be priced at will. There is nothing to be said against the high price as long as consumers are willing to pay for it and merchants are honest about the origins. That’s why most of the defrauded consumers are complaining that Da Vinci is deceiving them about the origin of the furniture, instead of the quality itself. Why would someone lavish 700,000 RMB on sofa? Why would someone spend hundreds on imported cosmetics whose cost is only a few dozens Yuan? It is a problem that merits an analysis. 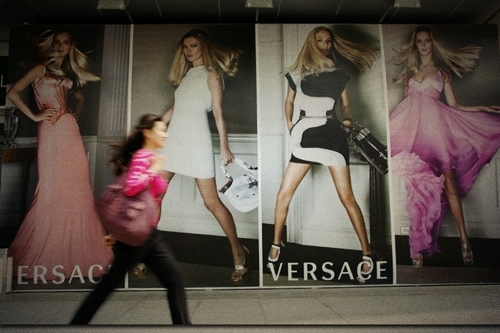 Luxury goods have grasped psychology in consumer spending in China. Part of these loyal consumers are eager to distinguish themselves from others by consuming high-end brands to show their levels and tastes. The higher a product is priced, the more popular it is among consumers. There is a crucial factor we shouldn’t neglect is that most of China’s consumer goods brands came up gradually after reform and opening up o the outside world. Few of them are ranked as top brands. Apparently, the speed of brands development in China fails to reach the speed of a group of Chinese people become rich. This group of people naturally chooses western brands which are mature and well-recognized. Then I noticed a lot of Chinese brands are inclined to give themselves foreign names. I thought Metersbonwe was a foreign brand until my old boss corrected me. Davinci is another vivid example. Some local brands or stores don’t even have Chinese names. They are registered with foreign names to promote the brand image among consumers. These merchants surly know Chinese consumers well. Most of us tend to believe that foreign brands are good brands. Imported goods are products with good quality. They are supposed to be expensive. But the truth is, most consumers don’t have the capacity to identify the quality of the brands and their products. We just take it for granted that it’s more likely a product is good if it is priced high. Every enterprise is purchasing maximum profit. However, the basic is to ensure the quality especially for luxury industry as it has had the biggest profits already. In my opinion, high profits should be built on a brand’s additional value rather than lowering the cost. The cost of luxury goods takes a relatively low percentage in the retail price. There is no point using bad material to further lower the cost. When the economic condition permits, a group of consumers would love to buy luxury goods because they believe these luxuries are excellently made. As a rational consumer, I don’t think I would ever purchase Davinci furniture. I can afford a 500,000 Yuan closet but that doesn’t fit my consumption concept. It doesn’t matter where a product is made. I more care about the quality and price performance. A couple of my female friends were very upset when I informed them that Lancôme, Sisley and other international cosmetics brands failed to pass the summer supplies quality inspection, which was released earlier this month. They are firmly conceived that these expensive products can keep them young and beautiful. “It must be more effective. That’s why it’s much more expensive,” one of my friends said. Sadly, now we know better than ever before that not all the expensive foreign brands ensure us good quality. For those who worship foreign brands, it’s better to ask yourself before you purchase next time: do I really need this product? Why do I want to buy it besides it’s a foreign brand? How much do I know about this brand and product? These questions seem more necessary to be asked since the deceiving has been exposed. I’m sure there are more brands like that in the market. It’s time to open our eyes and be more careful when purchasing fancy foreign brands, or any other brand.